Those interested in an anti-snoring solution may be interested in a new gadget that has just landed on Kickstarter. It comes from a Chinese-based outfit called VVFLY Electronics. Following their 2016 crowdfunding campaign on Indiegogo which raised over $285,000, they are back with a new and improved version. 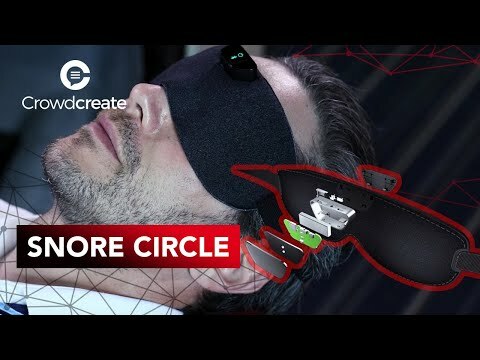 Whereas the previous Snore Circle came in the form on an anti-snoring earpiece, the new device takes the shape of an eye mask. To ensure comfort, its made of ecological soft high-density sponge and only weighs 32 grams. Featuring advanced bone conduction and sound recognition technologies, the intelligent mask identifies snoring sounds and then intervenes physically with micro vibrations at 36 levels to stop snoring and make you sleep better. There is also an accompanying smartphone app which you can use to adjust the sensitivity and intensity of vibration. As the mask doubles up as a basic sleep tracker, the app will show your sleep duration, snore-stopping times, snore level and more. If you are tired of snoring and disturbing your partner at night, Snore Circle may be the answer to your prayers. This is actually the fourth version of the product since the company came into being some three years ago. The first three generations boast more than 200,000 customers. The wait for Kickstarter backers should not be long as the intelligent sleep mask is scheduled for delivery in January. VVFLY Electronics is also offering a 30 day refund if for any reason you’re not completely satisfied with the product.